Your chin forms part of the border of your face, working to define your face from your neck. However, when the chin is too small or too large, this definition can become a little under or over exaggerated. When it comes to traditional aesthetics, a larger, defined chin in men is considered attractive. While a smaller, more delicate chin in women is considered appealing. Whatever the case with your own chin - if you have insecurities about it, this can be changed through chin plastic surgery. If you're considering a chin augmentation, here's how it can enhance or balance out your profile. If you're unhappy with the way your chin looks, have insecurities about your profile or the size of your nose, a simple answer could be a chin augmentation. An underdefined chin can make your profile look out-of-balance, it may also make your neck look too long or enhance the size of your nose. If you suffer from some of these common insecurities, a simple chin implant can do wonders for eliminating this. In fact, many patients looking to undergo a rhinoplasty have undergone a chin augmentation first and found this balances their profile perfectly. On the other end of the spectrum, if you feel your chin is too large, a simple chin shaving procedure can do wonders to change this. Decreasing the size of your chin can lead to a far more feminine looking profile for women, while it can help to balance the shape of the face in men. So, with this in mind, who is a chin augmentation procedure best-suited to? A chin augmentation is best-suited to both men and women who are unhappy with the look of their profile due to a recessive or enlarged chin. The most common form of chin augmentation surgery is the enhancement of this portion of the face to help balance out the profile. It's also fairly common for many patients to combine rhinoplasty with a chin augmentation procedure. However, a rhinoplasty is not always necessary, as mentioned. There are two common forms of chin augmentation, the first is chin surgery, using a silicone implant. The second is the use of injectable fillers - a far less invasive approach. During the chin surgery, you are anesthetized with a general anesthetic or put under IV sedation. Generally, the incision is made underneath your chin where a surgical pocket is formed and the silicone implant is placed. The chin implant is positioned on top of the bone, just below the lower lip. In some cases, the incision will be made on the inside of the mouth, but this is a far less common procedure. Both incision points are minor and scarring is generally minimal. After the procedure, you will have small sutures in your chin for a few days while the scar heals. For the non-surgical route, injectable fillers comprised of a hyaluronic acid-based product are injected into the chin area to add volume. However, keep in mind that these fillers only last a few months and will need to be topped up. One of the main concerns with regards to a chin augmentation is an infection. The risk of infection tends to be more common in intra-oral insertion - when an implant is inserted through the mouth. If an infection does arise, this could lead to complications in your recovery as well as tissue loss or a revision surgery to correct things. The intra-oral approach is often associated with increased pain and swelling during recovery but is mostly performed to avoid external scarring. This is why the extra-oral approach is far more popular, due to a lower risk of infection, pain and swelling post-surgery. During this approach, the implant is not exposed to saliva which is known to carry germs which increases the risk of infection. 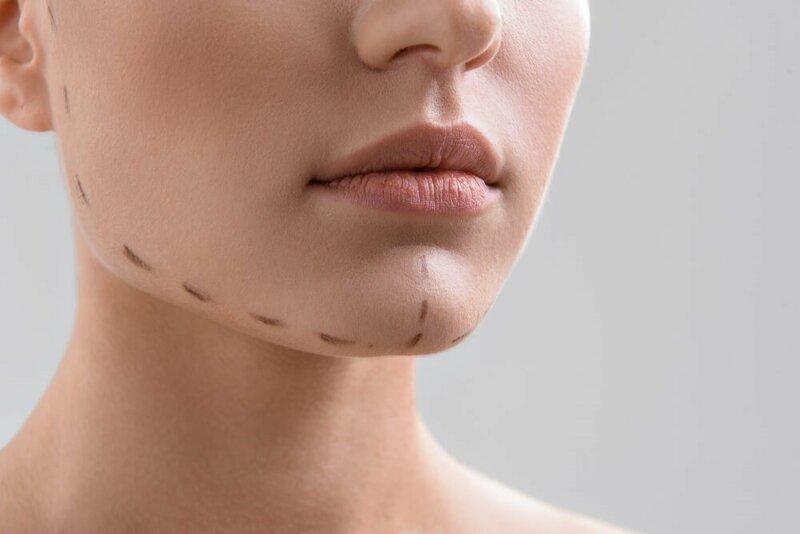 Scarring is minimal and barely noticeable as it rests underneath the chin, additionally swelling and healing time is far quicker through this approach. The best part about chin plastic surgery is that it produces instantly gratifying results, transforming a patient's face just as they envisioned. While these results are extremely satisfying, it's worth noting that immediately after your surgery your face will likely be quite swollen and discolored. This is only temporary, with all the swelling and bruising subsiding after an approximate two week period. Chin augmentation has a very high success rate with the rate of healing dependent on the recovery period. During your first few days after your surgery, you should expect to feel some discomfort, pain, swelling, and bruising around your chin area. Your surgeon will advise you not to exercise for approximately two weeks while you recover, limiting your mouth and facial movement during this time. If your chin appears larger than you imagined after your surgery, this solely attributed to swelling. This should subside after two weeks, revealing your new chin shape and size. Your doctor will also prescribe pain medication where necessary and instruct you to limit yourself to eating softer foods during your recovery. If you follow these post-op instructions carefully this should ensure a faster and smoother recovery time. While the risks associated with a chin augmentation are very low, there are still a few to keep in mind. Very rarely do patients suffer from these complications, but it's important to follow post-op recovery instructions carefully to avoid this. At Romanelli Cosmetic Surgery we are specialists in chin plastic surgery and would love to assist in creating your ideal profile. If you have any questions, queries or concerns regarding a chin augmentation procedure, please get in touch with us today.